When we discuss personal growth, we are talking about change within ourselves. Personal growth requires constantly changing and refining our weaknesses and improving upon our strengths. We can change our way of thinking, our physical well-being, our emotional capabilities, our finances and even our sense spiritual connectedness. Even when we accomplish a change in one area, we usually can find other areas that need improvement - Constantly and without end. Personal growth is an ongoing process. However, in order to grow or change successfully, it is important to understand how change occurs. 20 years ago, Carlo C. DiClemente and J. O. Prochaska, two researchers known in the alcohol addiction field, proposed a five-stage model of change. This model was developed to assist addiction professionals with understanding their client’s level of motivation to change. 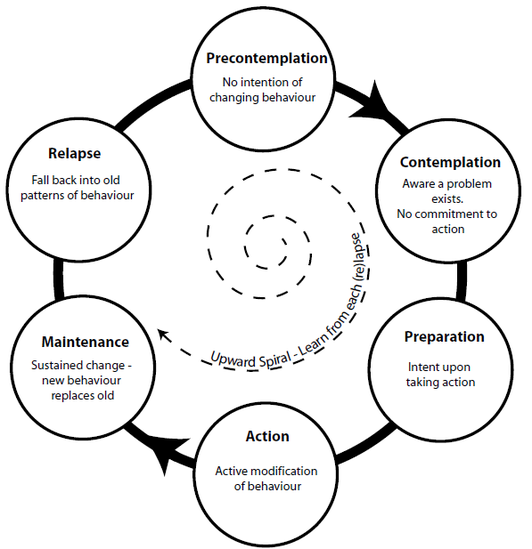 While this model was developed by observing those with addiction, the five stage model of change can be used for anybody who is interested in self-transformation at every level. In this stage, the person may not even be aware that a need for change exists. They are either unaware or possibly in denial that the need to change exists, and this is the stage at which there is no intention to change behavior in the foreseeable future. Dr. DiClemente identified four reasons a person may be n the precontemplation stage, which he referred to as “the Four Rs”: reluctance, rebellion, resignation and rationalization. Reluctance: The inability or refusal to acknowledge that a problem exists. The person may not be consciously aware of the need for change, and the person also may be in denial. Rebellious: There is a resistance to being told what they have to do or that they have to change. True to the word "rebel", the person refuses to change or acknowledge the need for personal growth just to resist or rebel against. Resigned: The person is overwhelmed by the need to change, the problem itself or even with the idea of change. The person may even be resigned to the belief that they cannot change or grow. They have accepted that they are unable or unwilling to change, and they have no intention of doing so. Rationalizing: The belief one holds that they know what is best for themselves and has all the answers. They believe that the problem is not themselves, but everyone else’s problem. They are able to rationalize why they do not have to change or why they do not have a problem. In this stage, the person is willing to consider that a problem exists and that they may need to change. A person in this stage may be ambivalent, and they may fluctuate between wanting to change and convincing themselves that there is no need to change. This stage is not a commitment to change or personal growth, but an awareness that there might be an issue or weakness. They may have problems making the decision to change. This stage is a commitment to making a change. For those seeking personal growth, this stage allows the individual to acknowledge the problem, identify what needs to change, and makes a commitment to make the change. The individual at this stage makes a plan with action steps to implement change in their lives. In this stage, the person has begun to act on the plan. The person actively works on the steps outlined in their plan to achieve their goal of self-transformation. Personal growth goals can be competed individually or with the help of others. For example, a person may seek out a financial advisor if they are working on securing their finances, and a person may seek a professional counselor if looking for emotional stability as part of personal growth. This stage involves time. Once a person has made personal growth changes, it is important to maintain the changes. This is the ability to maintain change over time. Personal growth is a process of a constant challenge to evolve. Many people are not aware of the need to change, while others can identify the need to change and actively implement their plan of action. If a person has made positive changes and achieved progress, it is important to maintain these developments and continue moving forward.